Ministerial Committee headed by PM passes comprehensive plan to boost China exports, strengthen cooperation in many fields. Another indicator of the burgeoning alliance between Israel and China was seen Tuesday, as the Ministerial Committee for Chinese Affairs, headed by Prime Minister Binyamin Netanyahu, approved a plan to deepen and widen bilateral financial ties. 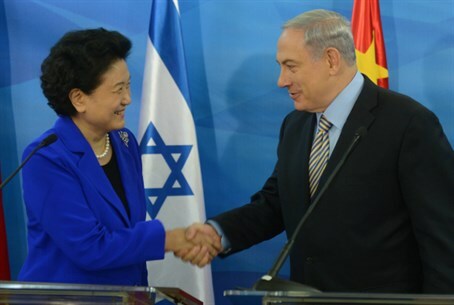 The approval comes on the momentum of Chinese Vice Premier Liu Yandong's visit to Israel, which on Monday included signing a bilateral cooperation agreement with Netanyahu and inaugurating a new academic institute to strengthen cultural ties. Through the newly approved financial plan, Israeli exports to China will increase to an annual amount five billion shekels (roughly $290 million) within a five year period. The state will dedicate 49 million shekels (around $14 million) a year in order to carry out the plan. Eugene Kandel, Chairman of the National Economic Council, was appointed by the Committee to head the team advancing the new initiative, a team which was established after Netanyahu's China visit last May. The team works in connection with its Chinese counterpart to focus state efforts advancing the bilateral ties. Kandel is expected to likewise chair an inter-ministerial steering committee to coordinate government aid strengthening financial ties with China. That committee will include members and professional representatives from the Foreign Ministry, the Finance Ministry, and the Ministry of Economics. The approved plan includes governmental recognition of wide-ranging business projects conducted with Chinese partners in the fields of hi-tech, agriculture, environmental protection, energy, water technologies and health, among others. Work groups on each topic will engage with their Chinese counterparts to advance the capabilities of Israeli companies in China, and the potential for mutual investment. Additionally, the plan will see the opening of a new center to advance the projects in China, and the Finance Ministry will open a new financial delegation in China. A new policy to ease entry permits to Israel for Chinese business people, tourists and academics will also be explored. The Prime Minister's Office notes that since Netanyahu's visit to China last May, Chinese VP Yandong has come to visit after Chinese Foreign Minister Wang Yi visited last December. Numerous business delegations have also arrived, notably one headed by senior members of the Chinese corporation Fosun, as well as a visit by 15 Chinese mayors and diplomats from various provinces. In recent years the export of Israeli goods to China has risen by 180%, from $878 million in 2009 to $2.47 billion in 2013. Likewise the export of tourism services to China more than doubled itself in the same period, rising from $30 million to $65 million. On another Asian front, Kandel accompanied Netanyahu to Tokyo last week, where Japanese-language Asahi Shimbun quoted him calling for greater financial cooperation with the Asian economic power of Japan - which boasts the world's third-largest GDP - as well. "The presence and cooperation of Japanese corporations are lacking in Israel. In various industrial fields, there are numerous Israeli corporations that can become partners of Japan," Kandel said in a Tokyo press conference. While tensions have been rising between Japan and China lately over land disputes, among other issues, the rival nations both appear open to Israeli ties.